It was an unexpected and very pleasant surprise. Occasionally I help out at the local United Reformed Church and yesterday led their morning service. Expecting a handful of people in the congregation, predominantly elderly, it was wonderful to welcome a party of over 20 young people from 11 different nations who were staying in Wooler on an international young people’s camp. They certainly enlivened the service and whilst their presence required a revision and revamping on the spot of how to present what I had prepared, it was a very stimulating and enjoyable morning, which everyone in the congregation appreciated. It was such a pleasant experience, given the appalling and disreputable newspaper headlines and television covering of the crisis in Calais recently. 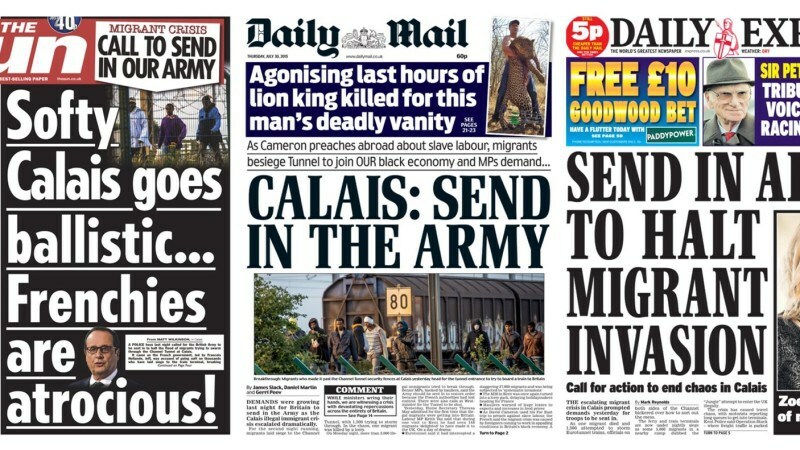 The appalling, toxic language that has been deployed by the media and lamentably by politicians, including the Prime Minister, has only served to fuel the antagonism, hostility and antipathy towards migrants. David Cameron has evoked international criticism by he describing migrants in Calais trying to get into Britain as a “swarm” and his knee-jerk popularist response to the crisis was to speak about strong armed tactics, offensive measures including dogs to deter the migrants from entry. TO READ MORE, HERE’S THE LINK TO ROY’S BLOG.